When we packed up the weekend before last, we thought we’d just be spending one more weekend in Blois before going to Australia for five weeks on 10th September. 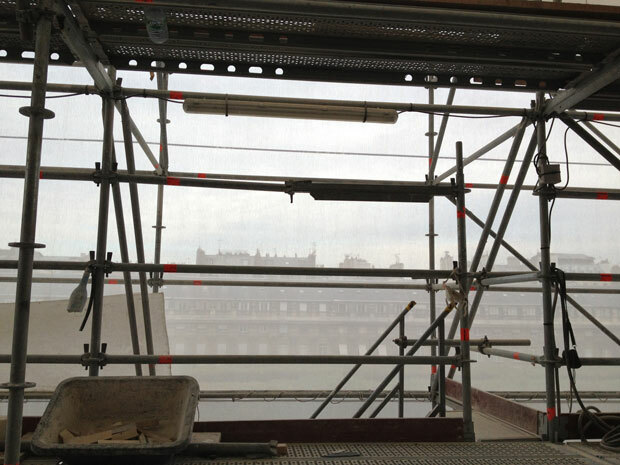 But on Friday, I was working away in my apartment in Paris (I’m a freelance technical and legal translator) when a large set of scaffolding suddenly hove into sight. I knew it was coming because I’ve been subjected to all sorts of banging and shouting and music and dust for the last nine weeks from my neighbours’ balcony. But I had been told our turn was the end ofAugust. So I had a long chat to the worksite boss, who soon appeared in front of the window. “But it is the end of August !” Well, not quite. I thought I had at least another week to go. He told me the worst would be during the next two weeks, starting Tuesday, when they would be demolishing the large vases and balustrades using their pneumatic drills, from 8 am to 5 pm. During that time, the wooden shutters and windows have to be kept closed at all times, leaving practically zero light in my office and the living room. Fortunately, the other side (bedroom and kitchen) won’t be affected. I find it difficult to be deprived of light at the best of times, but 10 weeks of darkness day and night is like a nightmare, not to mention the noise. I’m one of those people who are allergic to radio music when I’m working and these particular workers are very keen on loud rap. At least I’ll be able to do some gardening and cycling, especially this week, because it looks as if the good weather’s here for a little while longer. This entry was posted in Cycling, Loire Valley, Paris, Renovation and tagged balusters, cycling. Bookmark the permalink. Such a shame that they’re blocking off that lovely view! Will they be replacing the vases along with the balustrades? Some of the vases are currently white stone and some are reddish. They’re removing the reddish ones of which we have one out of three. My eyes popped when I saw they were demolishing the vases. Will they replace the red ones with white stone, or is it final once they’re removed? Be reassured! They are replacing the red ones with white stone. It will look exactly the same as before, only all the same colour. They are actually demolishing the whole balcony so I understand. Relationnel rang me at lunchtime and said the pneumatic drilling was horrendous and that I’d made the right move! That’s funny that the bit about demolishing the vases caught Carina’s attention. She had exactly that same thought as me. I was ready to put on my shoes and rush over to your place to save them…although I guess that I would have been too late! 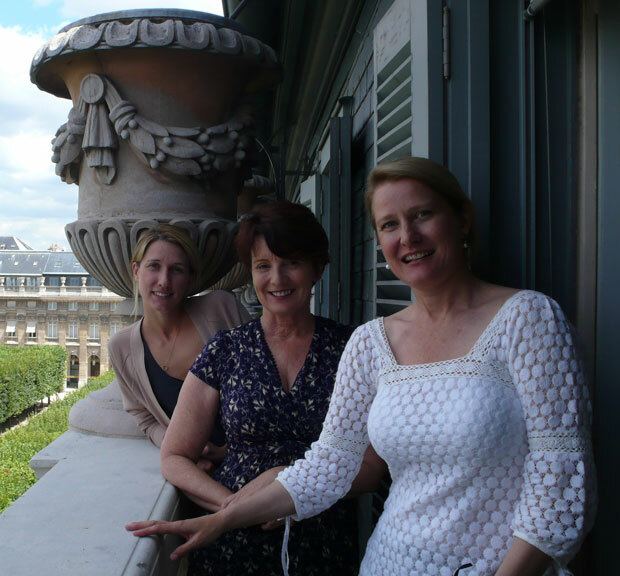 Seeing the photo from the bloggers’ breakfast that you so kindly hosted brought back good memories. We’ll have to get together when you’re back from Australia. 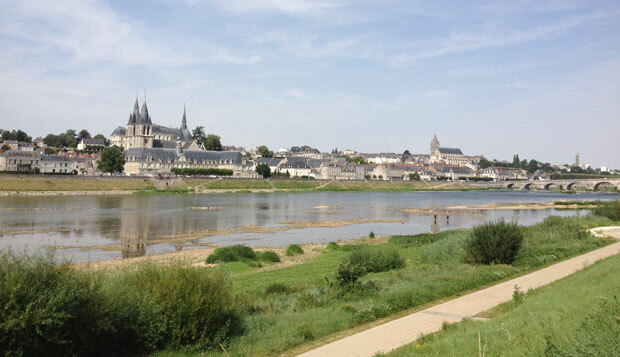 In the meantime, enjoy the peace and quiet in Blois! Will you continue blogging and tweeting while you’re on vacation? The Palais Royal is a listed monument so they have to put everything back the way it was before. That’s why they’re taking down the red vases and replacing them with white stone. And they’ll be chip, chip, chipping away once they get the blanks up there, so I understand. My blogging and tweeting will depend a lot on my internet connections and how much time I spend with family and friends. I haven’t been back for 3 years and am organising a big family reunion during the second half of the trip. But we’ll be having 12 days in Tasmania where I’ve never been before so I hope I’ll have a lot of photos to share! And yes, we’ll definitely have to have a breakfast when I get back and the work is finished – probably at the beginning of November! 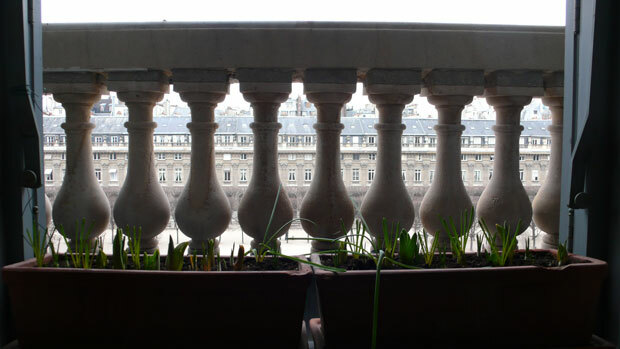 Such a shame…the vases & balustrades look lovely & in keeping with the Palais Royal & gardens!